we secretly wish we could keep them for ourselves. 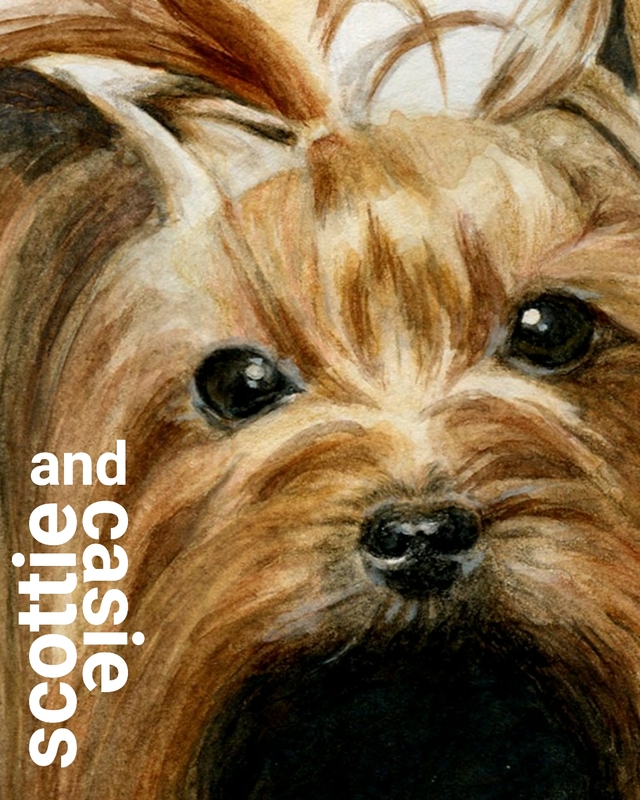 We’re Scottie and Casie – two Yorkies with a mom who’s super passionate about dogs and fine art. We officially launched our website in Jan 2018 and are super excited to create some very gorgeous paintings for our furiends!! We’re currently accepting commissions. Please contact us to check our availability. Our beautiful paintings turn heads. You can’t help but to stop and look. And then look again and again. Long lasting. Timeless beauty. Our hand-painted artwork will be a conversation piece for years and years to come. 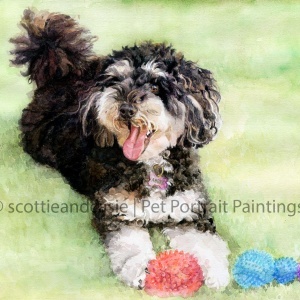 I got a painting done of my dog Abbie, she is my ball obsessed girl. As I was getting a full body painting and we had some photos of her with balls in them, I asked scottieandcasie to include them in her painting which they happily did. My girl is never without a ball and I wanted to capture her true nature ‘ball obsessed’ as a painting without a ball, is not the true Abbie, they also included the spikes on the balls which I though was a nice touch. I was kept informed with email updates and the instagram video were amazing, and the final painting well all I can say is WOW!! WOW!! is was AMAZING, it captured my girls nature. It was packaged with care and arrived in Australia from Canada in a little over a week. 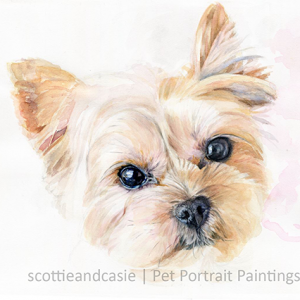 I would recommend scottieandcasie to anyone who wants an amazing painting of their furbaby. Love their work!!!! 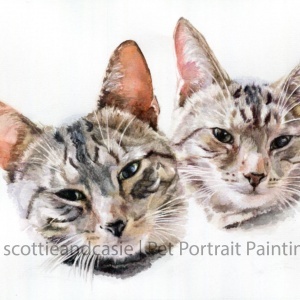 I commissioned a portrait of my two cats, Alex and Max, as an anniversary/Christmas present. The result was astonishing: completely lifelike, with detailed fur, whiskers, and markings. She even captured their individual expressions so you can tell right away which cat is which. This is an extraordinary way to celebrate your pets and support live artists – so much more rewarding and unique than a photograph! Highly recommended! 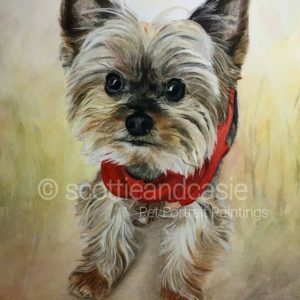 I recently received the painting of my little dog, Coco, from Scottieandcasie. It’s perfect in every way. Coco is a really pretty dog and the painting captures that in every way. From Coco’s big brown eyes to the cute little hair that always sits over her nose. CC emailed me regularly from start to finish, regarding what I wanted and the progress of Coco’s painting. Our painting flew across the ocean all the way from Vancouver to Australia and arrived in perfect condition. If you want a beautiful keepsake of your fur baby I’d highly recommend Scottieandcasie. 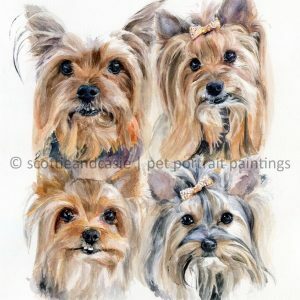 I had a portrait done of my 4 Yorkies. Oh I just love it! CC it so easy to work with, you can see all the love CC put into it. She kept in touch with me, sent me emails and photos of her progress. When I received the portrait it was packed very well, with instructions on how to take care of it….it was even more beautiful in person! Absolutely beautiful. She is an amazing artist! I would recommend her to everyone. Thank you CC! CC did an amazing job. 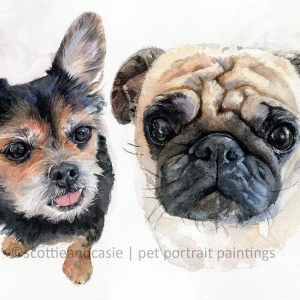 I ordered two portraits – one for each of my dogs. CC communicated very clearly throughout the process and kept me up to date, sending photos of her progress! As each one is done by hand, it was nice to see the portraits come together. She even hand-delivered the portraits to me, which was awesome and the paintings were well packaged and protected. When I saw the paintings in real life they exceeded all my expectations. She did an amazing job and I am so happy with them. Thank you CC, Scottie and Casie! 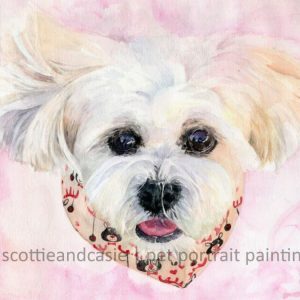 I highly recommend Scottieandcasie for pet portraits; CC is a talented artist. I commissioned a painting of my Yorkshire Terrier, Maggie, and the artwork exceeded my expectations. CC transformed my photograph into a work of art, and it is stunning, my friends and family agree. Maggie is a big part of my life, and I wanted a painting of her to have with me forever. From the beginning to end, the communication for the commission was clear and timely. Very professional with a quick, friendly response. The piece was packed with care and arrived in a few days. 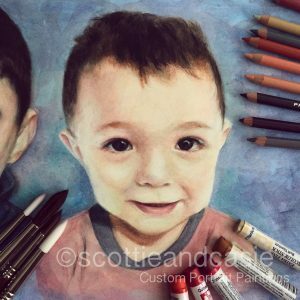 Working with CC has been a gratifying experience, and I hope others will take my advice and commission a beautiful painting from Scottieandcasie. 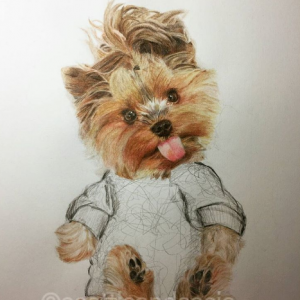 After seeing how beautiful the portrait my brother and I commissioned for my parents came out, I decided I needed to have one of my own baby, my Yorkie named Spike. From the beginning picking out which photo to use, to the day it arrived on my doorstep, Scottieandcasie was helpful, professional, and absolutely fabulous to work with! The finished portrait is so special to me… it’s a portrait of love- Scottieandcasie’s love that was put into creating it, my love for my baby boy, and the love that I will feel every time I look at it. My brother and I wanted to do something special for our parents for Christmas. 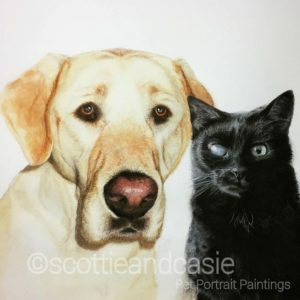 I found Scottieandcasie on Instagram and commissioned artwork of my parent’s dog and cat, Molly and PussPuss, who have both crossed over the rainbow bridge. When it arrived and we all opened the package together it was a “tearfest” seeing how beautiful and life like it is. If you’re thinking of getting something like this you really need not look any further than Scottieandcasie. 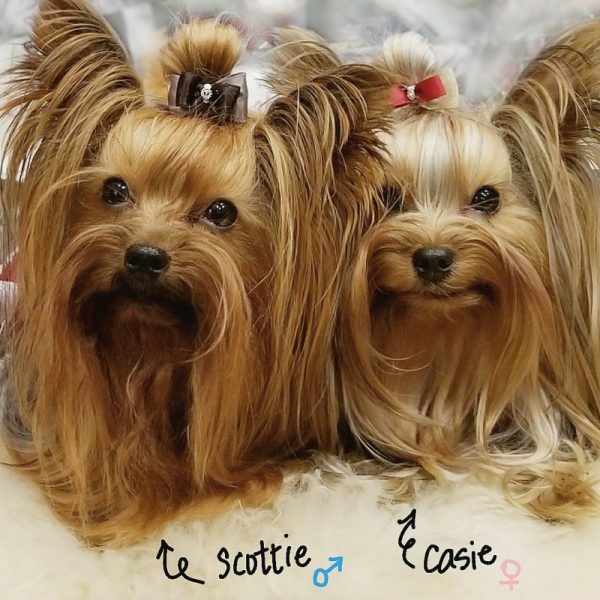 I’ve already sent Scottieandcasie my yorkie’s photo and have referred several friends. Ready to commission a painting?